Rustic weddings are no longer a trend. They are here to stay. The theme has been a favorite of brides for sometime now, and it's no question why. The look is gorgeous, and it's even more breathtaking when it has a chic, romantic spin as this beautiful setup does. The central DIY wedding project that makes this look what it is is the incredible Romantic Lace Table Runner, and the other details tie the whole look together. 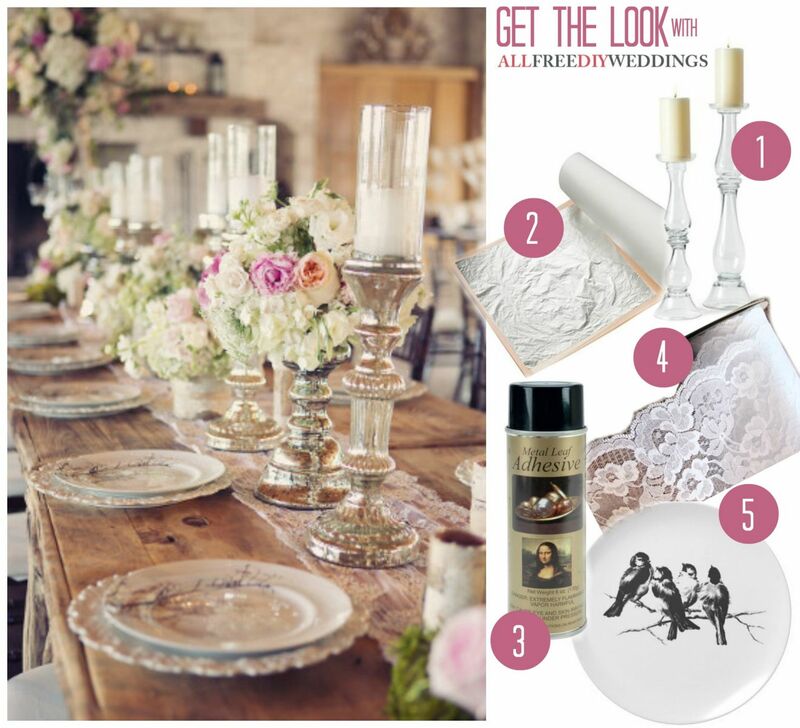 It's darling, stylish, dreamy, and any bride would love to sit down to a table like this. Creative wedding ideas don't need to be expensive, as proven by this beautiful and easy DIY wedding idea. 1.) Purchase lace fabric as wide as you prefer and at least 5' longer than your table. 2.) To make finished ends, create a 1/4" hem, and stitch. 4.) You are going to leaf the outside of your glassware. Spray the surface with metallic leaf adhesive, and let dry. The more adhesive, the more leaf that will stick. For a very antique look, use less adhesive. 7.) Fill the glassware with flowers and/or candles. Here's how to arrange flowers. 8.) Place the table runner on your table. Alternate candlesticks, high flower arrangements, and low flower arrrangements for a varied look. 9.) Purchase vintage plates from a thrift shop, rent them, or use heirloom items. Place a more decorative plate on top of a piece with a decorative outer edge.